In some ways, Star Trek: Enterprise ends where it should have began. A lot of the final stretch of the final season seems dedicated to exploring the show’s original sin, the flaws that came baked into the premise as early as Broken Bow. After all, Bound had taken the cringe-inducing adolescent fixation on “sexiness” that informed ideas like the “decontamination gel” and pushed them to their sexist extremes. Similarly, In a Mirror, Darkly, Part I and In a Mirror, Darkly, Part II offered the revenge of the two members of the ensemble all but forgotten in subsequent years while pushing the show’s early reactionary tendencies to eleven. Under the Earthlight. The serious Earthlight. 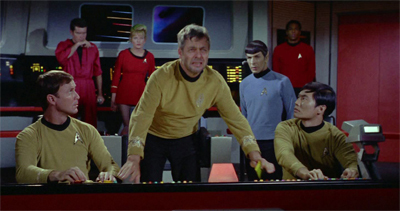 Even These Are the Voyages… seemed to confirm fears that the show had been built as a sequel to Star Trek: The Next Generation and Star Trek: First Contact rather than a prequel to the original Star Trek, a fear shared by many fans frustrated by elements like the design of the ship or the appearance of the Nausicaans in Fortunate Son or the Ferengi in Acquisition. That final episode left open the (admittedly remote) possibility that the entire show was nested inside the holodeck of Picard’s ship. Demons and Terra Prime touch on the same introspective ideas, by taking the show’s final two-parter (if not its de facto finale) and using it to tell a story that probably should have been told half-way through the first season. It seems like the production team have finally decided to grapple with the core themes of Enterprise. Just at the last possible minute. Borderland establishes the format that will come to define the fourth season of Star Trek: Enterprise; the mini-arc, a single story told over two or three episodes before moving along to the next adventure. Technically speaking, Storm Front, Part I and Storm Front, Part II established the format for the season. However, the franchise had done multi-part season premieres before. 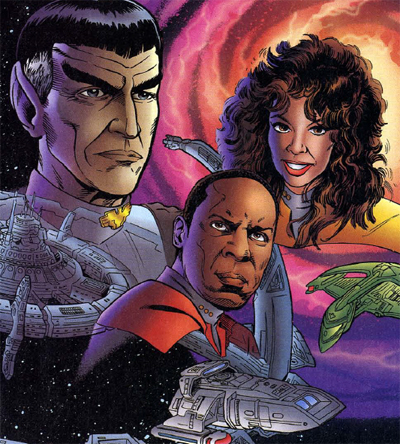 Star Trek: Deep Space Nine was particularly fond of the format, seguing from a status quo altering season finale into a multi-part season opener; The Homecoming, The Circle, The Siege, The Search, Part I, The Search, Part II, The Way of the Warrior, Image in the Sand, Shadows and Symbols. This is to say nothing of the massive six episode arc that opened the sixth season. Put your hands together for Mister Brent Spiner. Borderland represents a departure because it signals that the fourth season of Enterprise will be comprised entirely of multi-episode stories. 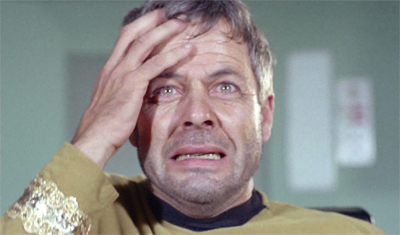 Historically, Star Trek shows had typically done one or two multi-part stories in a season, give or take a cliffhanger to bridge two years of the show. The fourth season of Enterprise would tell seven multi-part stories eating up seventeen episodes of the twenty-two episode season order. It was certainly a bold departure for the series and the franchise. In fact, Borderland begins the franchise’s first three-part episode since the second season of Deep Space Nine. (Although determined fans could likely stretch logic a little to suggest that Tears of the Prophets or Zero Hour were season finales that formed a three-parter when tied into the two-part premieres that followed.) It is a curious departure, and one that immediately helps to establish the fourth season of Enterprise as something quite distinct. Whatever is to be done about the Romulans?